Subject: What Is a YieldCo? NRG Energy Inc. (NYSE: NRG) launched the solar industry YieldCo trend in July 2013 with NRG Yield Inc. (NYSE: NYLD). A half dozen more have followed, with another in the pipeline. That one's a joint venture of First Solar Inc. (Nasdaq: FSLR) and SunPower Corp. (Nasdaq: SPWR). Solar YieldCos alone have raised more than $8 billion in capital over the past 18 months, a figure expected to triple over the next few years. While the term "YieldCo" may be new to a lot of investors, how one works should not be. YieldCos have much in common with the master limited partnerships (MLPs) popular in the oil and gas industry or the real estate investment trusts (REITS) favored by the commercial real estate industry. So what is a YieldCo, exactly? YieldCos are separate companies created by a parent company for the purpose of operating finished projects. This new company has an IPO and becomes a publicly traded stock. In the solar industry, YieldCos typically operate solar farms, but the company can also own other kinds of energy assets. The sale of solar energy generates cash flow that is used to pay out a dividend, usually in the 3% to 6% range. Instead, YieldCos are structured to reduce taxes as much as possible by matching the cash flow from operations with losses from depreciation and expenses. 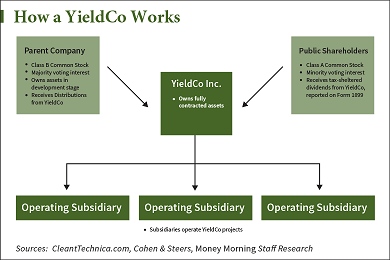 This structure also means that shareholders in a YieldCo receive a 1099 dividend form at tax time instead of the slow-to-arrive and more cumbersome K-1 form that owners of MLPs receive.